The Monday after Jamie Foxx’s crew extolled the positive virtues of the Detroit area at the MGM Grand Casino in Greektown (and live on Sirius XM), some good news came out of the Motor City. Ford reported a $1 Billion profit in the third quarter of 2009. This is the best financial news to come out of Detroit/Dearborn in a long time. 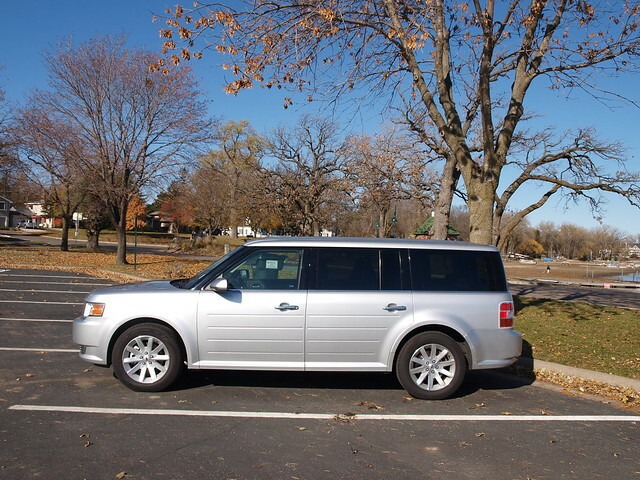 To celebrate, I figured a Ford product was in order: The Ford Flex. Here’s the problem: When I reviewed the Saturn Outlook (and mentioned a brief drive in a friend’s Chevrolet Traverse beforehand), I didn’t get around to questioning the worthiness of a crossover seating seven people for the lack of efficiency and economy. However, in a column on I wrote for some podcast on the same subject, I offered up the Flex as an option to resolve the four-inch deficiency the Outlook had on the Traverse. I should’ve delved further into challenging the notion of whether a seven-seat crossover, especially one that supplants a minivan in the lineup, would do the trick as a proper transporter of a large number of people and their luggage on trips. That scenario became evident when I originally questioned the Flex’s existence. As with the Traverse and the Outlook for GM, the Flex effectively replaces Ford’s minivan product, the Freestar. It also replaces the Taurus X, an SUV-like curiosity based on the same platform as the Ford Five Hundred/Taurus/Mercury Montego/Sable/the last generation of the Volvo S80. Incidentally, the Flex is based on the same platform and will share its DNA with the newly released Lincoln MKT. The Flex’s existence also plays into another problem: Ford has too many crossover and SUV products! Currently, Ford offers six such models (plus two Mercurys and three Lincolns). Is it really a bad thing to have a choice when Toyota has five crossover/SUV models (plus three Lexus models) in their lineup? The strange thing is that with the Flex, I have driven four out of six of those products (the exceptions being the current iteration of the Explorer SporTrac and the Expedition). This gives me some sort of perspective as to whether the Flex fits in the scheme of things when picking a Ford that neither a sedan, a Mustang nor an F-150. The Flex itself is a throwback with modern styling. Think Scion xB or Honda Element boxiness that harkens back to your childhood. When I was a child, the king of all family transporters was the Ford Country Squire. Take a huge LTD and affix a long enclosed rear end. Slap some fake wood on the sides and back (I’m talking my childhood – the 1970s in particular) and you have the envy of all aspiring families. My dad had one, a 1974 Country Squire, despite his departure from the Stern household two years prior. I’m certain he didn’t get one to transport Mom, Matt and I! My point? The Flex reminds me of a Country Squire for today’s discriminating family. It has seven seats that fold for a plethora of cargo and seating options. If I listed the options I came up with, your bandwidth would begin to slow down a bit. I will say how much I was impressed with the depth the cargo area behind the third-row seats, when in the “up” position and when the third row was down, giving a flat run right at tailgate height. 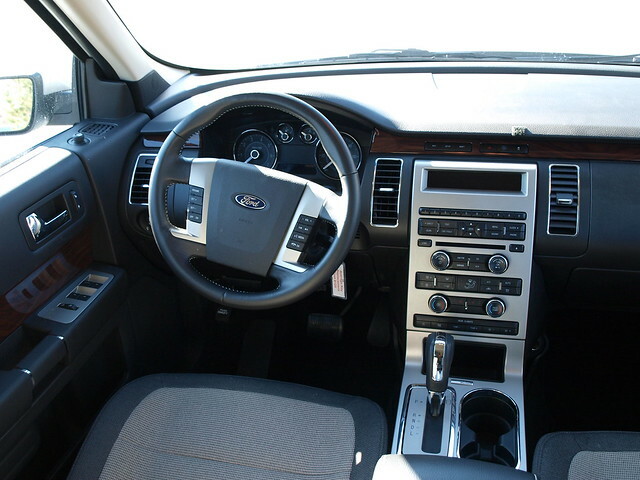 Behind the wheel, I had a bit more comfort in the 2010 Flex SEL I sampled than in the Outlook. It also helps to have the Flex on a more Earthbound plane for entering and exiting the vehicle. The lower perspective of the vehicle helps in commanding it with the instrument panel at the right height for me. Again, a common problem with Fords has been the center stack design and the positioning of heater/air conditioning controls. There is a rear HVAC system that has a master control up front. Try working on that when you’re driving! No thanks. The SEL I sampled has Ford’s SYNC system. Sadly, I decided not to play with this feature considering the frustrations I had with said infotainment system in other Ford products. Instead, I made sure to be extra careful with switching through my Sirius satellite radio presets. Under the hood is Ford’s regular 3.5-liter V6. Later this year, the Flex is expected to get the EcoBoost version of the same motor, adding a turbocharger and a supercharger to the mix. The Flex becomes the third application of Ford’s new motor technology that maximizes power and economy at the same time. In the meantime, I had no problems with the regular 3.5-liter as connected to Ford’s familiar six-speed automatic. It motivated quite nicely in traffic and around town. I was afraid that the weight would be an issue, but alas I found the Flex to be nimbler than the Edge (built on the Fusion platform, BTW). How nimble? It wasn’t unwieldy, but rather soft for my taste. It didn’t pitch while it rode, which is a huge plus in my book. Handling was quite competent, though you felt the leans in the curves when pushed. I could use more agility in the steering, but it also does not feel you’re steering a large yacht, either. Lastly, the brakes work quite well with this paean to the station wagon. As for the economy loop, you might say that it didn’t surprise me. The Flex turned a 20.5 MPG loop, about what I’d expect a Ford Taurus to turn these days. So, after four Ford SUV/crossovers, which one would I choose? Personally, I have no use for a seven-seater. Nor do I have any use for a hulk like the Explorer or a stout being like the Edge. Then, I remembered what a friend in Duluth said about sitting in the back seat of the Escape. He loved the second-row headroom (he’s tall, you know). As for the comparison with GM’s big crossovers, it would depend on whether you prefer to be Earthbound or suspended above the din of traffic. I like the solidity of the Traverse in the way it carries itself. However, the Flex has the easy access to the cabin and the deep well in the rear that changes into a flat floor with the second and third row down. I’ll also give the Flex the edge on fuel economy – no pun intended. For long drives, I still am not convinced that any of the crossovers or SUVs mentioned in this post is an honest solution for the ultimate family getaway. 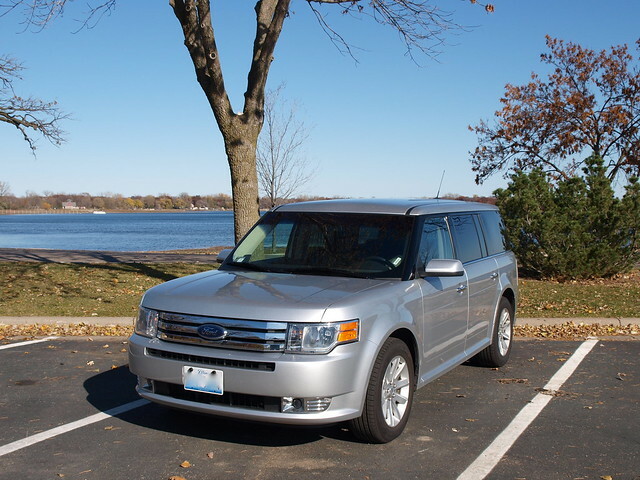 If you must choose, the Ford Flex is a charming idea. Just think back when you rode in the rear-facing third row of your family’s station wagon – except you’re the one saying “Don’t make me stop this car” to the kids. PRE-OWNED VEHICLE INFORMATION: Per a search on several car shopping sites, V&R found there were several 2010 Ford Flexes available between $8,900 and $15,500. Mileage and condition vary, but most were found with over 100,000 miles on the odometer, the highest being over 152,000 miles. Always have any vehicle inspected before purchase.